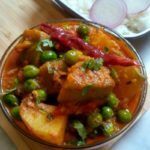 Kaddu Aloo Matar sabzi | How to make Pumpkin, Potato and Green Peas curry – Sharing a simple, hearty, comforting pumpkin, potato and green peas semi gravy recipe that can be served as a side dish with rice, roti, paratha or puri. Pumpkin is called as Kaddu in Hindi, is an everyday vegetable in Indian homes. It is a good source of minerals, potassium, beta-carotene, and vitamin C. Its low calories and high fiber contents make it a perfect vegetable for the weight watchers and the diabetic. 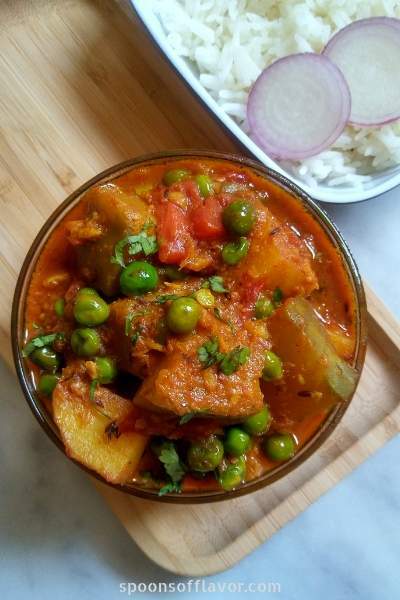 This kaddu aloo matar sabzi is an onion, ginger, garlic, and tomato based curry. Here I have sauteed potato and pumpkin cubes with onion. Hence the veggies are cooked in their own juice. Easy… isn’t it… and tasty too. Adjust the spices as per your choice. This curry can also be made without potato. But addition of potato makes it even more delicious. Therefore I always love to add potato in this recipe. 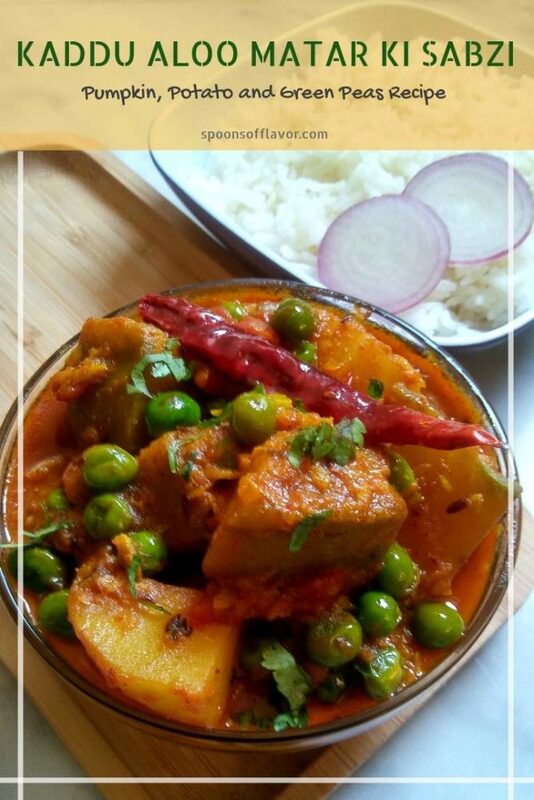 Kaddu Aloo Matar sabzi is a simple, homestyle pumpkin, potato and green peas semi gravy that can be served as a side dish with rice, roti, paratha or puri. Heat oil in a pan. Add bay leaf, cumin seeds, and dry red chili. Once cumin seeds start crackling, add grated onion followed by pumpkin and potato cubes. Fry the onion, pumpkin, and potatoes together over medium heat for 2-3 minutes. Add ginger-garlic paste and stir for 2 minutes. Add chopped tomatoes, turmeric powder, red chili powder and saute for 2 minutes or until the tomatoes become mushy. Add cumin powder, coriander powder, garam masala powder, and kasuri methi. Again stir for 1 minute more. Add 1 cup warm water. Stir to mix. Add green peas. Now cover and cook over low to medium flame until the veggies cooked. Once done add chopped coriander leaves. Stir to mix and turn off the flame. 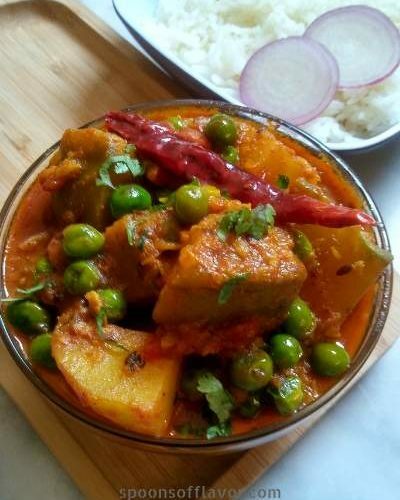 Kaddu aloo matar sabzi is ready to serve. Serve hot with some steamed rice, roti, paratha or puri. Do not overcook the veggies or the curry won’t taste great. Adjust the spices as per your need.